Chewy cookies filled with crushed Butterfingers! The Butterfinger. Crispety, crunchy, peanut buttery goodness covered in chocolate. I love ’em which is why I decided they belonged in another favorite of mine…. cookies. 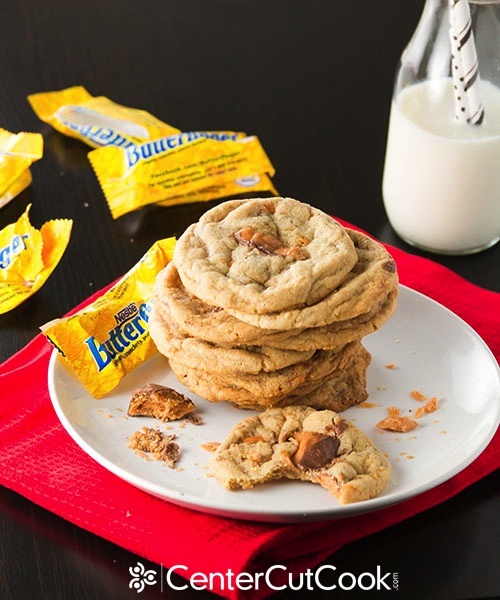 Meet the Chewy Butterfinger Cookie! It’s like a chocolate chip cookie, but in place of the chocolate chips are big chunks of Butterfinger candy bars. 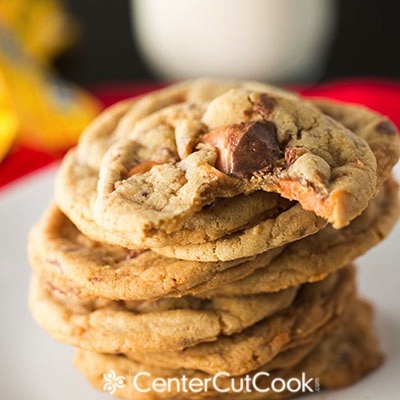 I started with a simple recipe for chewy chocolate chip cookies, chopped up a bunch of Butterfingers and folded ’em into the dough. One tip I’ve learned lately is that if you want to avoid flat cookies, chill the dough for a couple of hours prior to baking. When I’m in the mood to bake cookies, I usually don’t want to have to wait for the dough to firm up. Sometimes I wait and I get thicker, more beautiful cookies while other times I don’t and the cookies are a bit more flat. They still taste delicious, so I’m totally okay with it. I guess what I’m getting at is… if you want thick cookies, chill the dough. I like my cookies to have a bit of “character” on the outside, so I crushed up a couple more Butterfinger candy bars and carefully pressed the bits on top of each dough ball so that when they finished baking, there’d be Butterfingery goodness on the top of each cookie. Worth it! Another key to fabulous cookies is to almost under-bake them. I pull my cookies out right when I see the first sign that they are starting to brown. At this point, they are almost impossible to get off the pan in one piece. Let the cookies cool for a couple of minutes before using a spatula to carefully transfer the cookies to wire racks to cool completely. The cookies will firm up as they cool. The result? 4 dozen Chewy Butterfinger Cookies. Perfect. Beautiful! With a mixer, cream together butter, brown sugar and sugar for several minutes until light and fluffy. Add in egg and vanilla extract and mix. In a large bowl sift together flour, cornstarch, baking soda, and salt. Slowly pour the dry ingredients into the wet and mix. 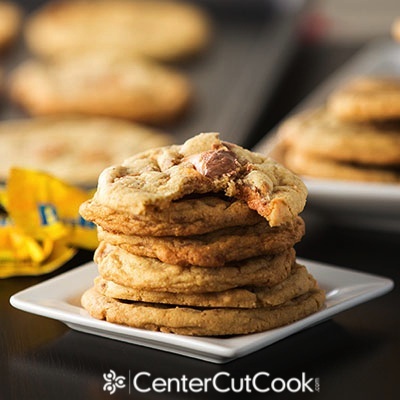 Fold in about 8 ounces crushed Butterfinger Candy Bars, reserving 2 ounces for garnish. Chill the dough for around 2 hours for thicker cookies. 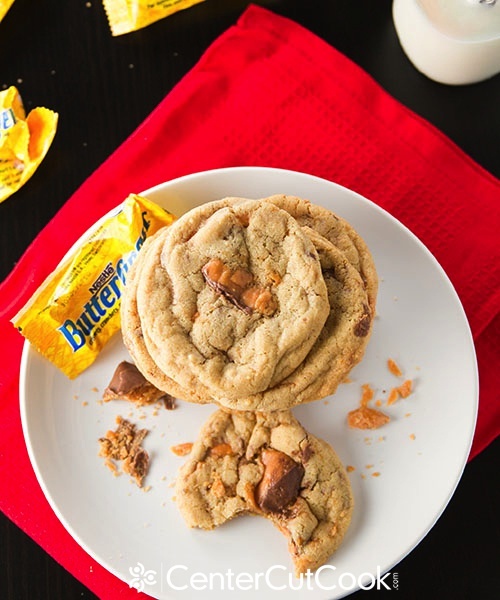 Press remaining crushed Butterfinger pieces carefully onto the top of each cookie ball. Bake for 8-10 minutes, or until the edges are just starting to brown. 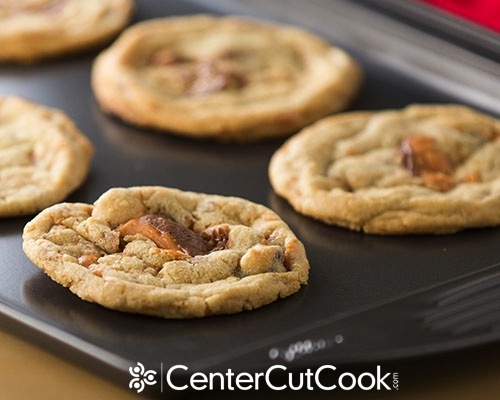 Allow the cookies to cool for a few minutes before transferring them to cooling racks to cool completely.